A ten-year study of grapevine hardiness in the face of drought has been conducted by a team led by researchers at the French National Institute for Agricultural Research. In their paper published on the open access site Science Advances, they report that the wine industry does not appear to be in imminent danger due to global warming, as some have suggested. Over the past several years, wine experts, connoisseurs and others have expressed doubts about the wine industry's ability to sustain itself as the planet heats up in the face of global warming. Many of the most well-known wine growing regions are expected to see less rainfall on average, and more and longer droughts. Growing grapes takes a lot of water, but what about the plants? How much water do they need to survive a dry summer? That was what the researchers sought to learn. If a plant does not get enough water, it will die—but how much is not enough? Some plants will wilt and refuse to produce fruit if they do not get enough water over one season, but can spring back the next when spring rains arrive. There is a tipping point, however. Prior research has shown that it generally occurs when plants start producing air bubbles in fluid channels—these embolisms prevent water from moving from roots to leaves when water does return, causing the plant to die. To find the tipping point for grapevines, the researchers submitted samples to two main types of tests. The first tests involved spinning vines in a centrifuge to force air bubble formation, taking measurements along the way. The team reports that all of the vine varieties they tested were resistant to air bubble formation. They found also that the vines actually grew more resistant to air bubble formation as they aged. The second test was more straightforward: The researchers water-starved plants in the lab and occasionally yanked off some leaves and twisted them like a sponge to wring out water to measure how much they contained. They found that it was not until approximately half of the sap in the leaves stopped flowing that the plants were unable to recover. The team also monitored vine growth, grape production and droughts in Napa Valley and Bordeaux over a 10-year period to see how they fared. They report few if any vine deaths due to drought. 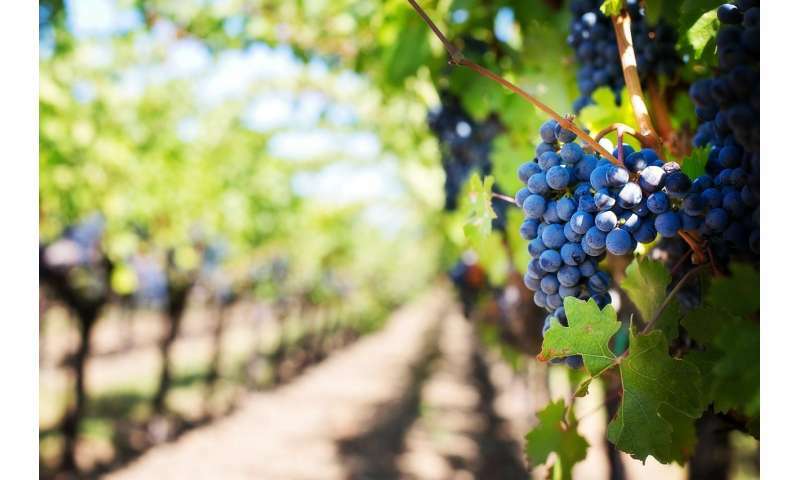 The researchers suggest their observations and experiments show that grapevines are quite hardy, and because of that, are not likely to die due to drought, which further suggests they should be able to survive despite global warming. Grapevines are crops of global economic importance that will face increasing drought stress because many varieties are described as highly sensitive to hydraulic failure as frequency and intensity of summer drought increase. We developed and used novel approaches to define water stress thresholds for preventing hydraulic failure, which were compared to the drought stress experienced over a decade in two of the world's top wine regions, Napa and Bordeaux. We identified the physiological thresholds for drought-induced mortality in stems and leaves and found small intervarietal differences. Long-term observations in Napa and Bordeaux revealed that grapevines never reach their lethal water-potential thresholds under seasonal droughts, owing to a vulnerability segmentation promoting petiole embolism and leaf mortality. Our findings will aid farmers in reducing water use without risking grapevine hydraulic integrity.